Information here is for archival purposes, and is not current. This entry was posted in Advertisements, Commerce, Glens Falls, Newburgh, Poughkeepsie, Schnectady on September 25, 2012 by hudsonvalleygal. 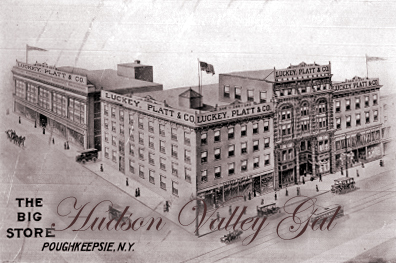 This is the huge mercantile establishment of LUCKEY, PLATT & CO., OF POUGHKEEPSIE. It is the largest store between New York and Albany. It is fifty times its original size. It has thirty-three stores in one. It has over two acres of floor space. It has over two miles of counters and shelves. It has a force of over 175 people to accommodate you. It is the trading center of four countries and has a mail order business that extends over the whole United States. Try the. Mail Order System or come and see this fine store when you need anything in WOMEN’S AND CHILDREN’S APPAREL. 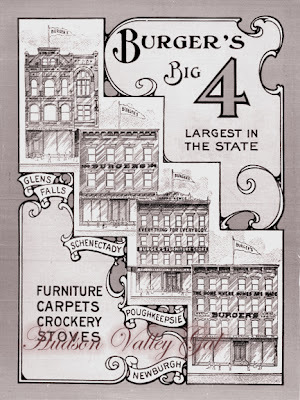 MEN’S FURNISHINGS, HOUSE FURNISHINGS, CARPETS, FURNITURE, WALL PAPER, ETC. This entry was posted in Advertisements, Commerce, Poughkeepsie on September 22, 2012 by hudsonvalleygal.